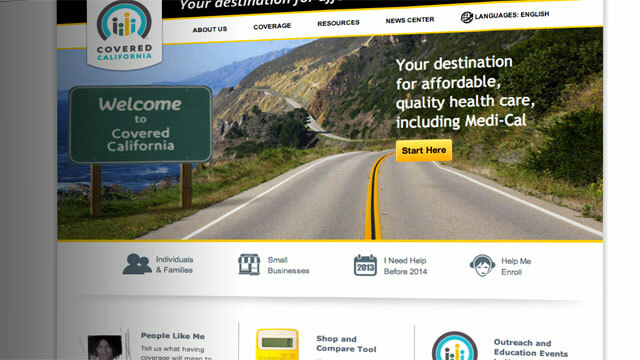 Screenshot from CoveredCA.com, the website of Covered California. California’s new health insurance exchange enrolled more than 35,000 people during its first month of operation, or one-third of the 106,000 people enrolled nationwide, according to federal government figures released Wednesday, which covered the period from Oct. 1 to Nov. 2. When compared against the 36 states which have elected not to set up their own exchanges and instead rely solely on the troubled website healthcare.gov, California’s enrollments dwarf that of all those states — combined. In the 36 states, about 27,000 people have enrolled. Kathleen Sebelius, President Obama’s secretary of health and human services released the numbers in a press conference. But later Wednesday afternoon, Covered California held a press event of its own and released data up to Tues., Nov. 12 – bringing total enrollees to about 59,000 people. Momentum appears to be building. On average, about 1,000 people enrolled in Covered California every day in October, but in the first 12 days of November, average enrollments exceeded 2,400 a day. Peter Lee, executive director of Covered California, said he was “very pleased with the numbers.” He also said he expected momentum to continue, as the Dec. 15 deadline for coverage that starts Jan. 1 approaches. “The four-week period from Nov. 15 to Dec. 15 is going to be big enrollment,” he predicted. In addition to the people who have selected a health plan, another 72,007 people were found to be eligible for Medi-Cal, the state’s version of Medicaid, with coverage starting on Jan. 1. Consumers can shop on the Covered California website or talk to trained staff directly at call centers or at many social service agencies. Insurance brokers are becoming certified to enroll people through Covered California. Lee said there are currently about 6,000 brokers certified, but he expects 20,000 insurance agents in total will be certified by the end of November. In addition to the Dec. 15 deadline, the other big date for Covered California is March 31, 2014, when open enrollment ends. Lee said that Covered California “forecasts” enrollment of between 500,000 and 700,000 people eligible for subsidies. While 75 percent of the people who signed up in October were not eligible for subsidies, Lee referred to October as an “anomalous month" because it was the first month. By comparison, when Massachusetts was implementing its own version of health care reform in 2007, the first month of sign-ups was also pretty anomalous. Just 123 people signed up – about 0.3 percent of the total number who enrolled by the end of open enrollment. Some information critically missing from Wednesday’s release was any detail on demographics, especially age of enrollees. Covered California needs to enroll young, healthy people in order to spread risk and keep premiums from spiking next year. Lee said some of that data will be released at the Nov. 21 Covered California board meeting. Lee said the website is “constantly being improved” and that it will be offline for two days this weekend while changes are being made. This post has been updated with detail from the Covered California press conference.